The Value of Your Home: Up or Down over the Next Few Years? It’s not your imagination: The housing market recovery is on a roll, upwards! A recent survey of over 100 real estate and economic experts predicts that by the end of 2013, home values will have increased nationwide by an average of 6.7% over a year ago. This is significantly more than the 5.4% bump anticipated in an earlier study. The Home Price Expectations Survey was conducted by Pulsenomics, LLC on behalf of Zillow. Based on market expectations, the panel predicts that home prices will continue to rise until 2017, coming very close to the record highs of May 2007. The rate of increase however will not be as dramatic as 2013, with appreciation anticipated to slow to 4.4% in 2014 and down to 3.4% in 2017. This represents a cumulative increase of 23.7% through 2017, at which point appreciation is expected to be more in line with historic norms. Interestingly, most panel members did not feel that rising interest rates would derail the recovery, unless interest rates rise above 6.0%. According to Zillow Senior Economist Dr. Svenja Gudell, “As long as interest rates don’t rise too far and too fast, most markets should be able to absorb these changing dynamics and remain healthy.” It is anticipated that as interest rates rise, investors will pull out of some markets, increasing inventory and helping to stabilize the market. What does this mean for you? If you are looking to buy, now is the time as prices will continue to rise. Looking to sell? 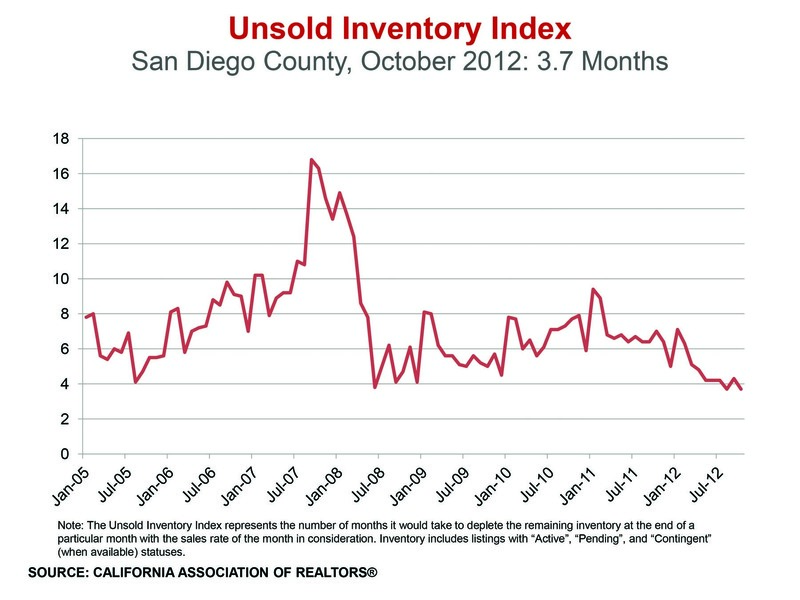 You are more likely to get top dollar between now and the end of the year as inventory, especially here in San Diego County is very limited. As appreciation slows and more inventory hits the market it is less likely that the multiple offer scenarios that we are currently experiencing will continue. Questions about the value of your home? Interested in an investment property? Just give me a call and I’ll be happy to answer all your questions. Freezing Temps in San Diego but Real Estate is Hot, Hot, Hot! Okay, I admit to being a total wimp when it comes to cold weather. Waking-up to frost on the roofs and going out for a walk with gloves and a hat is not my favorite part of living in San Diego in January. But I have to tell you that my heart is warmed as soon as I turn on my computer, look at my emails, my transactions, and the MLS and realize that the San Diego real estate market is hot, hot, hot! The lack of homes to sell in San Diego County is clearly illustrated in these two graphs, which show unsold inventory at lowest point since 2005, and that homes in the $750 – $1000K range are the most scarce. However, as there are fewer people able to buy in that range the impact is less dramatic. The price range where we are feeling the greatest impact is the $300 – $500K range. If you’re a seller, you love it as you will likely have multiple offers within days of listing. If you’re a buyer, not so much, as it’s likely you’ll be in a bidding war with several cash buyers. This of course has driven down the length of time homes stay on the market from approximately 60 days in January of last year to just 40 days in October. 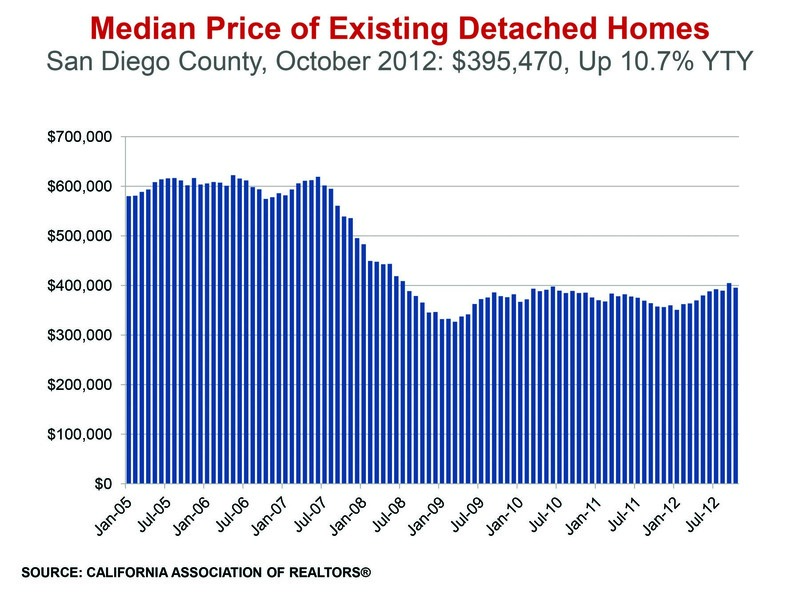 The net result of all these factors is that prices in the San Diego real estate market are increasing at a steady rate, up 10.7% this October, over October 2011. 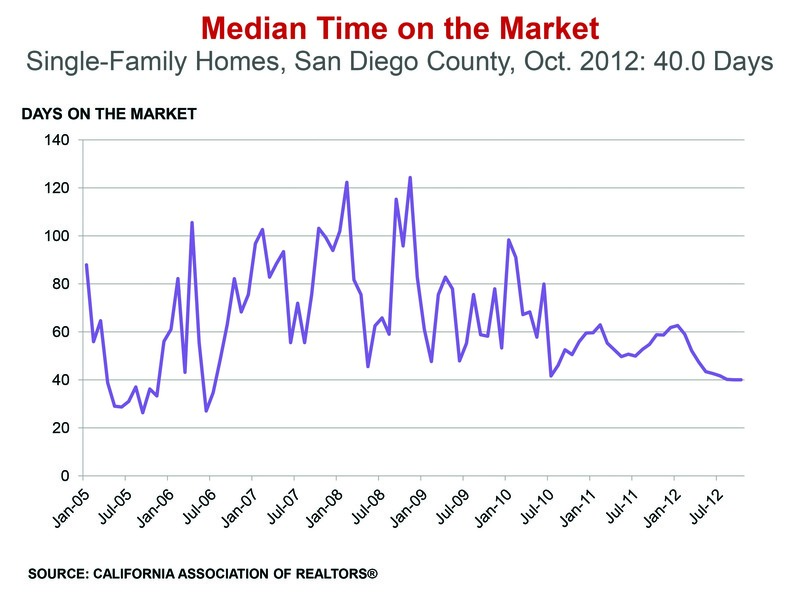 So is it a good time to buy or sell in San Diego? Absolutely! Barring any economic catastrophe I believe we’ll continue to see a strengthening real estate market throughout 2013. So if you’ve been considering a real estate investment, best to get in the game now as I predict prices will continue to rise. Please give me a call to discuss the opportunities available in America’s Finest City! 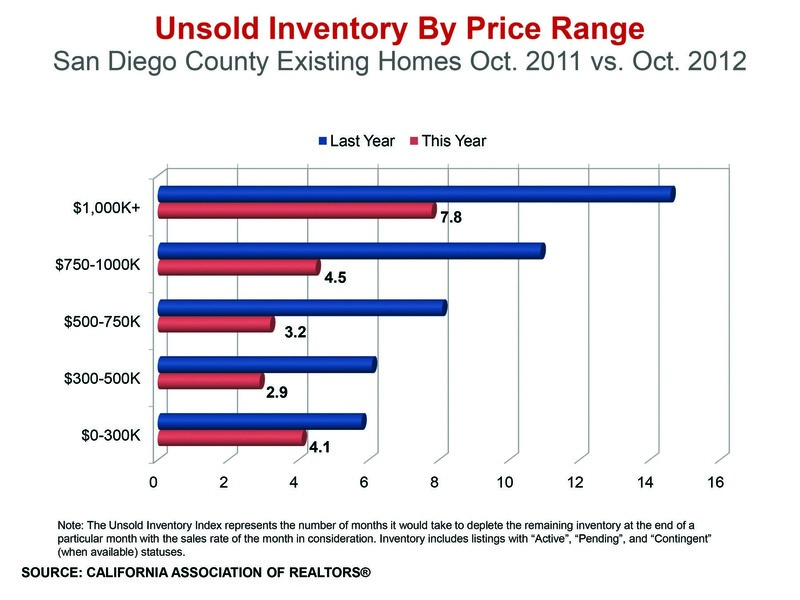 * Graphs and statistics courtesy of the California Association of Realtors®. All statistics reflect sales activity for detached homes.